Full camping arrangement on trek, including dining tent, sleeping tents, toilet tent, tables, chairs and cutlery. A challenging wilderness trek in the heart of the Annapurna Massif, with fantastic mountain scenery. An accessible yet genuine wilderness trek – few trekkers, or even locals, use this trail. A wild trek with breath-taking scenery that fits into a two week holiday. Cross the remote and challenging Naman pass, 4,850m/15,912ft. 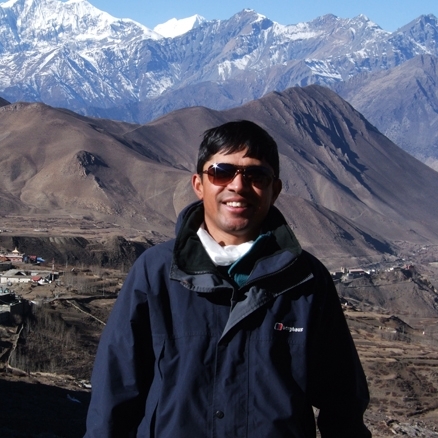 Enjoy incredible views of the Langjung Himal, Annapurnas, Machhapuchhre and Manaslu. This spectacular new trek in the Annapurna region follows an ancient Gurung trade route that ran between Lamjung and Manag and crosses a 4,850m/15,912m pass. The trail is also used by pilgrims walking up to the holy lake of Dudh Pokhari each August so footpaths are therefore well established. However the trek is not well known and you are unlikely to see any western trekkers until you join the main Annapurna Circuit at Timang for the final day of walking. With roads now encroaching on the traditional circuit at both ends, this new trekking trail is an inspired alternative for the discerning trekker. Leaving Siklis village you begin your trek weaving through rhododendron and bamboo forests until you reach open meadows with superb views of Himalayan giants such as Fishtail Peak, the Annapurnas, and the Lamjung Himal rising above them. Every day the scenery is sublime, and it is incredible that a route so close to the busy Annapurna Circuit can be uninhabited, unspoilt and totally wild. Your high point on this trek, the Namun pass, at 4,850m/15,912ft, provides a tough and rewarding objective with superb views of Manaslu by way of reward. The descent from the pass is steep but offers a final taste of the wild – snow leopard prints have been seen here - before you return to tea house ‘civilisation’ in Timang. You break the journey back to Kathmandu with a stay in the charming old town of Bandipur, with time to explore the traditional Newari streets and soak up some final panoramic views. For anyone seeking a relatively short but challenging Himalayan trek through genuinely wild mountain scenery, this little-known gem in the heart of the Annapurnas is the perfect choice. Meal arrangements: Breakfast in Kathmandu. All meals elsewhere. 13 x breakfasts, 11 x lunches, 11 x dinners. Fly to Kathmandu. Fly to Pokhara. Drive to Siklis. Start trek. Trek to Tasa. Trek to Thurju via Kori. Day walk to Dudh Pokhari. Trek across the Namun pass, 4,850m/15,912ft, to Dafne Kharka. Trek to Timang and on to Dharapani. End trek. Drive to Bandipur. Time at leisure. Drive to Kathmandu. Fly to London. On arrival in Kathmandu you will be transferred to the Shangri La Hotel. Kathmandu is a wonderful mixture of the ancient alongside the modern. Crowded bazaars still throng with local ethnic people today as they have for the past hundreds of years while roads are crowded with rickshaws, cars, roaring motorbikes and buses. Ancient temples and crumbling shrines sit alongside modern offices, picturesque palaces slowly sag into dereliction while Buddhist stupas gaze over the bustling scene with their all seeing eyes. Although this is a crowded, noisy and polluted city it is also friendly, fascinating and vibrant. Tonight you may choose to eat at the hotel, or you could head off into Thamel to one of the famous restaurants there, such as the Rum Doodle Restaurant, a place frequented by trekkers and climbers alike, with pride of place given to a board with the signatures of many Everest summiteers. Day 3 - Fly to Pokhara. Drive to Siklis, 1,800m/5,906ft - approximately 5 hours. You will be met at your hotel and taken to the airport for your flight to Pokhara. This is a spectacular and exciting flight in its own right passing over the Himalayan foothills, with views of the main range. From Pokhara, it takes about 5 hours to reach Siklis, although this dirt road is a challenging drive so the driving time totally depends on the road condition. The drive is highly scenic with great views of the Lamjung Himal and Fishtail Peak. The dirt road is rough and stony so be prepared for a long, slow, bumpy ride, but the fantastic scenery is ample compensation as the road twists and turns, mainly upwards, to Siklis. On the 2017 recce of this route, two lynx were seen on this drive! Siklis is a thriving, lively village populated by around 2,500 people. It's in a very picturesque setting. You will stay in a tea house overnight. Day 4 - Trek from Siklis to Tasa, 2,350m/7,710ft - 5 hours. Leaving Siklis you begin the trek descending on a good trail with stone steps. There are fantastic views of the Lamjung Himal and Annapurna II as you head out the village. After about 1½ hours you reach a suspension bridge at 1,400m/4,593ft, cross it, and then begin climbing on a stony trail. You may see woodpeckers on the attractive wooded hillside here. It will take you approximately 2½ - 3 hours to reach your lunch spot, usually taken where there is a stone water tap for the crew to use, at around 1,850m/6,070ft. After lunch you weave your way up steep stone steps through forested hillside for 1½ - 2 hours until you reach a clearing - your campsite for the night is at 2,350m/7,710ft at Tasa. There is a stone shelter here built by ACAP. There are spectacular views at the edge of the campsite of Lamjung Himal and the Annapurna range. The distant rumbling of avalanches on Annapurna II and IV can often be heard. Day 5 - Trek from Tasa to overnight camp at 3,500m/11,483ft - 6 hours. You can enjoy the early morning views at your campsite before heading off on a trail which rises gently through the forest for 1-1½ hours to a clearing at 2,650m/8,399ft with a view of Fishtail Peak and a small shrine with prayer flags. You continue your gradual ascent through oak forest, passing the odd area of grazing land. This uninhabited region is home to Himalayan black bear, danfe, musk deer and Himalayan thar. After around three hours walking, you will have lunch in the forest near the water tank (as water is scarce here and the tap is lower down it is likely to be empty). This spot is at 3,175m/10,417ft and next to an ACAP sign to Dudh Pokhari (the holy lake). The trail continues upwards through rhododendron and bamboo forest, passing sheep grazing clearings. You eventually reach a clearing at around 3,500m/11,483ft which will be your campsite for the night. There can be problems here with a lack of water, which may mean continuing to Kori at 3,850m/12,631ft. Day 6 - Trek to Kori, 3,850m/12,631ft - 3 hours. Today's walk involves approximately 3 hours of ascending through forest to reach Kori, which has a stone shelter, a goat hut and an ACAP sign. It's a wild, remote place with stunning views of the surrounding hillside and snow-capped peaks. Day 7 - Trek to Thulo Lekh, 4,100m/13,451ft - 3 hours. There are fantastic views of Fishtail Peak and surrounding snow-capped summits to be had on the ridge above the campsite. You follow a good undulating dirt trail contouring along the hillside through scrubland. The path is a little narrow and stony at times. After 1½ hours walking the trail opens out into a large meadow. Another hour or so brings you to an ACAP signpost to Dudh Pokhari at 4,080m/13,386ft. You continue following the red and white ACAP poles to Thulo Lekh. Alternatively your guide may suggest a 15 minute descent to the river and overnight camp. If you stay down by the river at 3,900m/12,795ft, it makes a pleasant afternoon acclimatisation hike to the lake and back. For this you need to retrace your steps to the sign to Dudh Pokhari, then turn right following the sign and a couple of poles, before heading left up a couple of knolls, and after about an hour from camp you'll see the lake. Day 8 - Trek to Thurju, 4,080m/13,385ft - 6 hours. Today's route is a spectacular one crossing two passes over 4,000m/13,123ft. You begin walking up the valley following the river on a trail which becomes a boulder field as you approach the high point of your walk - Rambrong ridge pass at 4,500m/14,764ft, adorned with prayer flags. It takes around 2 hours to reach the pass. From here there are superb views of the Manaslu range of peaks, Lamjung Himal, and Annapurnas towards the west. You then descend slightly on a good path, following the odd red arrow here and there, and contour around the hillside. After 1-1½ hours from the first (highest) pass you reach the second pass at 4,380m/14,371ft - Furju Deurali, which is marked by some cairns and an ACAP sign. From here it's approximately 1-1½ hours descent to your campsite at 4,080m/13,385ft. There are stunning views of Manaslu from here. If there's any snow on the steeper sections of the descent path, you'll need to take care with your footing. You can see a lake to your right and four stone shelters where your campsite is. Day 9 - Trek to Dudh Pokhari. For added acclimatisation, you can walk up to the holy lake where the pilgrims go in August - Dudh Pokhari. Day 10 - Trek over Namun Pass, 4,850m/15,912ft - 4½ hours. Descend to Dafne Kharka , 4,250m/13,946ft - 2 hours. The big day! You begin by walking on the flat, before descending to the river, crossing it and beginning your long ascent to the pass. The trail is fairly steep to begin with - route-finding is made easy though even if snow has obliterated the path due to ACAP's helpful poles at regular intervals. A zig zag path goes up to your right underneath a huge rock wall. At the top of this (2 hours) there are a few prayer flags and it flattens out. You then head round to the left, gazing down at last night's campsite and a beautiful lake. There are fantastic views of snowy peaks all around. The path is never too steep and is well marked with poles. You will feel the altitude as you make your final climb to the pass at 4,850m15,912ft, marked with prayer flags and an ACAP sign. There are superb views of Manaslu here. The descent to Dafne Kharka, 4,250m/13,946ft, gives glorious views and has some steep sections which require care if snow-covered. Snow leopard footprints were seen here in 2017. Day 11 - Trek to Timang 2,750m/9,022ft - 4 hours. After an initial 10 minute climb up to the ACAP sign at 4,280m/14,042ft, you descend on a good trail in open hillside to begin with whics then winds through the forest all the way to Timang. It's definitely a day for trekking poles to save the knees. At Timang you are very much returning to civilisation with tea houses and the jeep road through the Annapurna Circuit to Manang. Tonight you'll spend the night in a tea house and can enjoy such luxuries as a hot shower and/or a beer! Day 12 - Trek to Dharapani 1,900m/6,234ft - 2½-3 hours. It's a pleasant amble down from Timang to Dharapani, passing the occasional village and tea houses on the main Annapurna Circuit trail. You are definitely out of the wilderness now! You'll see the trail the other side of the suspension bridge in Dharapani leading to the Manaslu Circuit trail. Day 13 - Drive to Bandipur - 5 hours. Today you drive from Dharapani to Bandipur. It's a bumpy, dusty, dirt road from Dharapani to Besisahar (approximately 2 hours) so the going will be slow here. You'll see lots of trekkers toiling up the trail on the start of their Annapurna Circuit trek. Once on the main road the going is much easier and quicker and you should arrive in the lovely Newari village of Bandipur in time for a late lunch. You will stay here overnight to break the long drive to Kathmandu. Bandipur is a traditional Newari village, set high on a ridge, with pretty traditional houses and quiet paved streets. Once a thriving town on the trade route to India, Bandipur was left stranded when the main Pokhara to Kathmandu road was built far below in the valley. The village is proud of its environmental credentials and has been carefully restored while managing to maintain the traditional lifestyle of its inhabitants. Bandipur commands panoramic views of the Himalaya and on a clear day, from the village, you can see the whole Annapurna range in front of you, as well as peaks in Langtang to the east and Dhaulagiri in the west. You should have time in the afternoon for a bit of exploration and a leg stretch. There are some easy, pretty walks starting from your hotel in Bandipur bazaar, such as the walk to Ramkot village (2 hours), a walk in the mixed Sal forest at Raniban east of the bazaar, or to Purano Kot, an old fort, 20 minutes (about 500m) west of the bazaar. There is a small temple containing some old statues and next to it a newly built temple. Local people believe that praying here during a drought to the god Mahadev will bring rain. Day 14 - Drive to Kathmandu - 5 hours. Today you drive to the town of Mugling, and then head east on the main Kathmandu-Pokhara road. On arrival in Kathmandu you have the rest of the day at leisure to relax or head out to Thamel for some last minute shopping or sightseeing. It was described as a Wilderness Trek and it certainly lived up to it. Was brilliant to trek in an area where we did not see any other trekkers. The views were fantastic and although cold it was the views that took your breath away. Our Local Guide Mr Hom was so caring and knowledgeable, a great support team and excellent food (amazing what Cook comes up with whilst on trek). Bandiphar is a great find and really enjoyed the stay at The Old Inn before hitting the buzz of Kathmandu and sadly our farewell to Nepal. It's incredible that a trek so close to the Annapurna Circuit feels so incredibly remote. After you leave the village of Siklis on day 1 of the trek, you really are in wilderness terrain, where you are unlikely to see a soul until you reach Timang at the end. This ancient trading route has fantastic scenery throughout, with many snow-capped Himalayan peaks, a dramatic high pass nearly 5,000m high, a holy lake that pilgrims visit in the summer and fine rhododendron forests. We saw snow leopard prints in the snow descending from the pass in 2017.